Christa started writing when she was in elementary school and has continued making time to put pen to paper, or fingers to keyboard, ever since. After writing with a community of writers, following the Amherst Writers and Artist (AWA) method, she was trained as an AWA workshop leader. She loves the time she spends with her writing groups and facilitating retreats. She is also a past board member of the California Writers Club, Mt. Diablo branch and past co-leader of the branch’s Young Writers Contest. One of Christa’s passions is finding opportunities to express her own voice, the voice of her characters and celebrating the voice of other writers. She has a BA in Business and Masters in GLS. She has spent the majority of her life in management, first in the semiconductor industry and now in a non-profit. 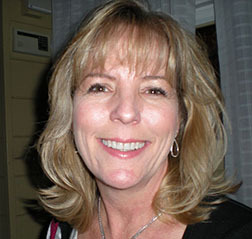 She is also on the Board of Directors for Catholic Charities of the East Bay. These days, Christa spends most of her writing time creating short stories and work related articles. She always has multiple creative projects going. In addition to writing, she quilts and does paper crafts. Read Christa's story here and return to learn more about her. WOW: You really nailed the voice of the narrator in "Through the Window." What gave you the idea for setting the story at an elementary school? Christa: One afternoon, my niece came home from elementary school and shared how one of her friends declared that she was not going to be friends with a girl in their class. Very much like the little girl does in my story. I was stunned and couldn’t get the idea of a young girl’s frankness out of my head. The story percolated until I couldn’t help but write it down. WOW: What do you think makes a compelling flash fiction story? Christa: Clarity of all the elements of the story. The reader needs to be able to enter into the story immediately and see a shift in the protagonist. This requires clarity of character and plot development, requiring the writer reduce the story down to its essence. WOW: Your bio says you are trained as an Amherst Writers and Artist workshop leader What is the AWA method and what does the training involve? Christa: Amherst Writers and Artists is a method of writing in community with an emphasis on supporting, honoring and celebrating the unique voice of every person. We believe everyone is a storyteller and everyone has stories to tell. But often our voices are dismissed and silenced. Through telling our stories in safe responsive communities, people are transformed. An AWA writing group is facilitated by a trained leader who invites several opportunities for writing at each session. Writers are invited (but not required) to share their writing with each other in a safe, affirming environment. This method was developed by Pat Schneider, and is described in her powerful book, Writing Alone and With Others. I wrote in an AWA group for a number of years and was encouraged by my long time AWA facilitator to apply to the training program. The training includes a study of the guidelines and principles of the practice, diversity of genres and forms and writing group facilitation. WOW: We'd love to know more about your crafty side, which includes quilting and paper crafts. Are there any that hold a special place in your heart? Christa: I’m a pretty serious person with a number of responsibilities. Play is challenging for me. That’s why I craft. It’s a place for me to mix things up, experiment and let things be messy. I love playing with paper and glue, and stamps and ink. I mostly make cards and journals. My great thrill is quilting. When I started quilting, I was very concerned that everything matched. Now, I enjoy pulling out fabrics that may not be obvious partners and introduce new patterns or colors until it works in a unique way. WOW: What types of books do you like to read? Christa: I read everything. Fiction, non-fiction. Essays, novels and short stories. I’m that person who reads the cereal box if there isn’t something else to read. I am always reading at least two or three books and listening to one on audible.com. Last year some of my favorite reads were: Euphoria, Lily King, The 6th Extinction, Elizabeth Kolbert, Deep, Down, Dark, Hector Tobar, The Sparrow, Mary Doria Russell and Everything I Never Told You, Celeste Ng. Currently, I’m reading Dept. of Speculation, Jenny Offill, Ten Windows-How Great Poems Transform the World, Jane Hirshfield, Mercy in the City, Kerry Weber and listening to Carol (The Price of Salt), Patricia Highsmith. WOW: That's an impressive list! Thank you so much for this interview, and we look forward to reading more great stories from you in the future! You ARE Interesting & Don't You Forget It! What Do You Think of my Manuscript?